This entire post was written in the exact spot this picture was taken. 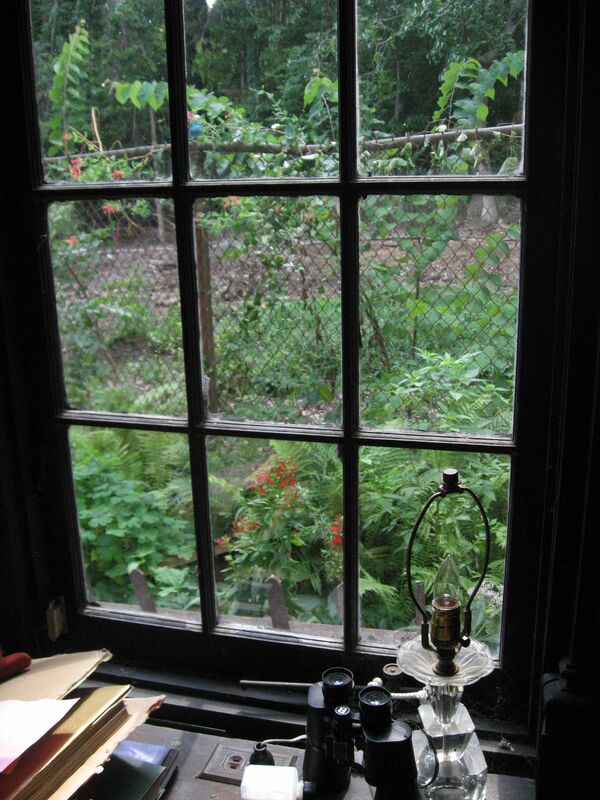 This is our summer season operating studio, a Victorian era-room that was once the practice studio of Philadelphia Orchestra violinist David Madison. From this window we can view two different Hummingbird attracting plants. It has large windows that overlook a narrow side yard. A 1960s era chain-link fence separates the yard from Morris Park. The fence is ugly enough, and made yet more ugly when a tree fell on it, bending the top. However, the fence has endearing qualities: It allows us to see into the park, and watch birds. We can see Robins along the ground. The fence is also there, and intact, which means we don’t have to put up a fence. The expense and work has been completed. 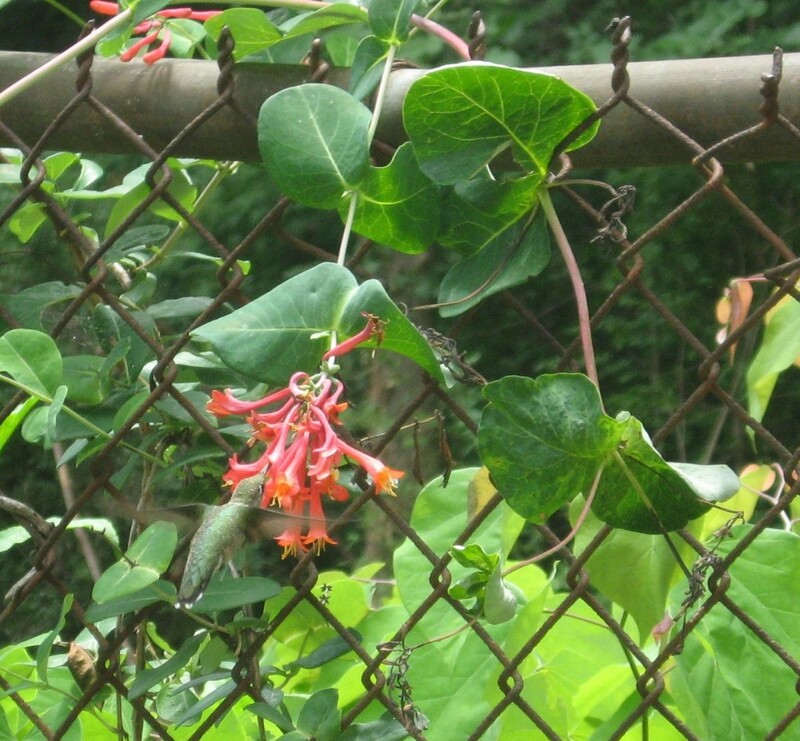 Also, the fence is very inviting for the climbing vine, Lonicera sempervirens, our native honeysuckle that is the main attraction. This Hummingbird really likes the juicy nectar of the Lonicera sempervirens flower. This plant has been sending out blooming flowers since June, almost 3 months of continuous blooming. The Hummingbirds ravage the flowers, and they get torn up. This appears to stimulate new ones, because the vine will send out even more flowers! Here the Hummingbird is in full nectar sipping mode. Now the Hummingbird is resting on the fence (to the left of the flower and up a bit). It likes the fence too. Hummingbirds like to have a tree or a branch near their nectar source that they can rest on between feedings. They need to conserve energy, especially when they have to fly over the Gulf of Mexico non-stop. The Lobelia is growing right next to the Honeysuckle vine. In order to get this picture, Sean was actually dodging hummingbirds that were swarming around, fighting over the flowers! This is Monarda didyma, also called Bee-Balm. Long tubular, brightly colored flowers, the trademark hummingbird magnet flower. 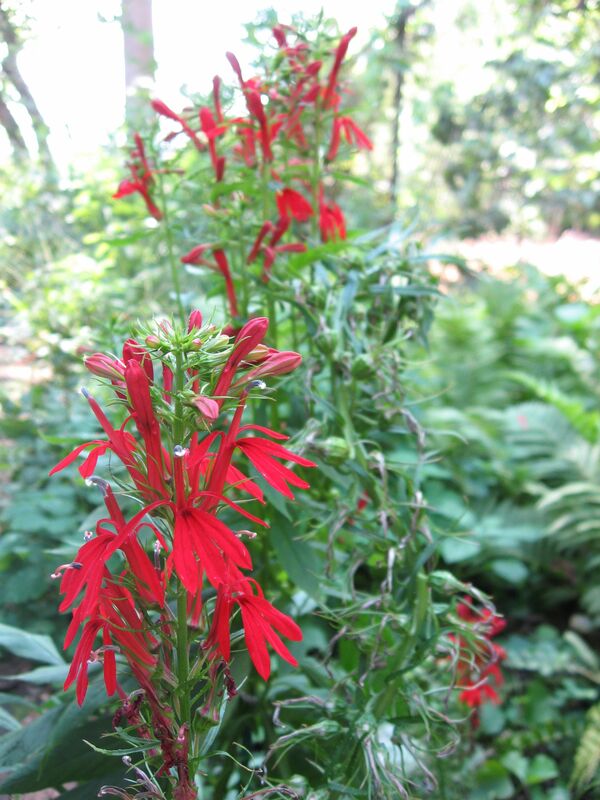 Not only do all of these red flowers make us ooh and ahh, as well as become very cognizant of the varieties and subtleties of the color red, they attract the hummingbirds we all want to grace our yards. Also, neighbors will envy your yard, and you can offer them some roots in the fall, and then they will have Bee-Balm/Trumpet creeper/ honeysuckle/etc in their yards, which will create a beautiful neighborhood and a more sustainable habitat for native wildlife. A win-win situation. This is a Hummingbird paradise, this large Campsis radicans vine growing along the back wall. Also called Trumpet creeper, this native vine is a hummingbird magnet. At this point we can watch hummingbirds from every room in the house! 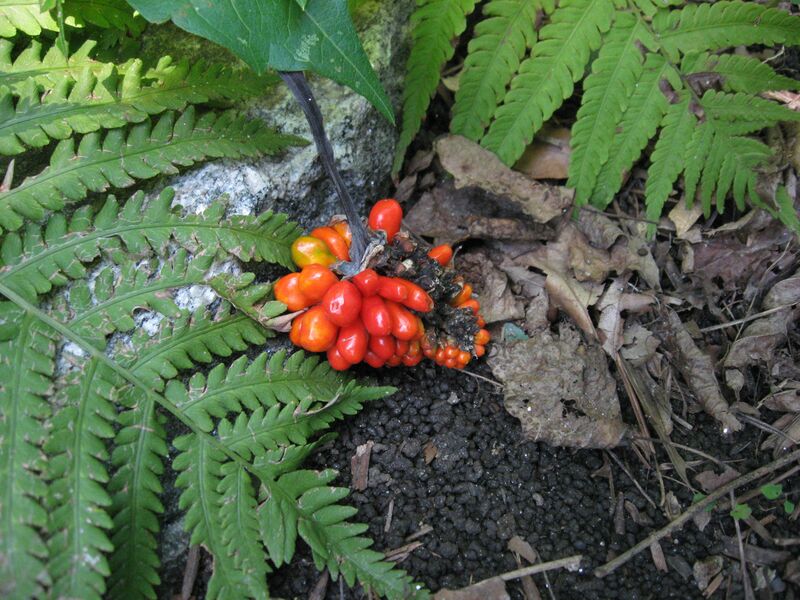 This American native vine hasnt yet reached the horticultural mainstream. It is usually ignored in favor of Japanese wisteria (and other Asian exotics), which has become a noxious weed that is now invading natural areas. Interestingly, The French have fully embraced this American vine. In the Parisian suburb of Aulnay-sous-Bois, the Campsis radicans vine graces many a wall. Too bad they do not have Hummingbirds in Europe, and the French environmentalists and concerned citizens should keep a close watch for any invasions of this introduced species! While taking pictures of red things in the yard, this came into view and must be noted. 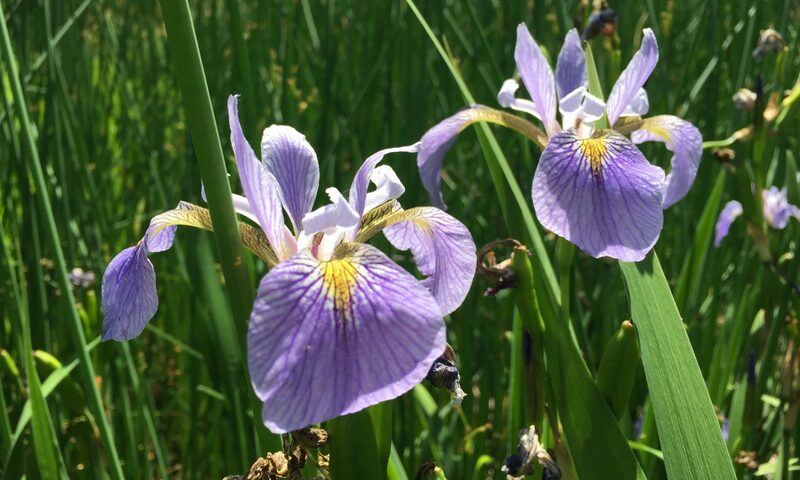 This is the seed production of an herbaceous woodland plant that is commonly discussed and observed in the spring and then it goes off the topic. This is the Arisaema triphyllum, the Jack-in-the pulpit. Its seeds have ripened and are now a magnificent red color. Some creature has been eating the juicy fruits and spreading the seeds to a new location. 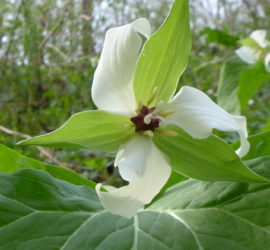 This is a great plant for your woodland garden. We will have many more of these in the years to come with all of these seeds. They sprout seedlings readily. 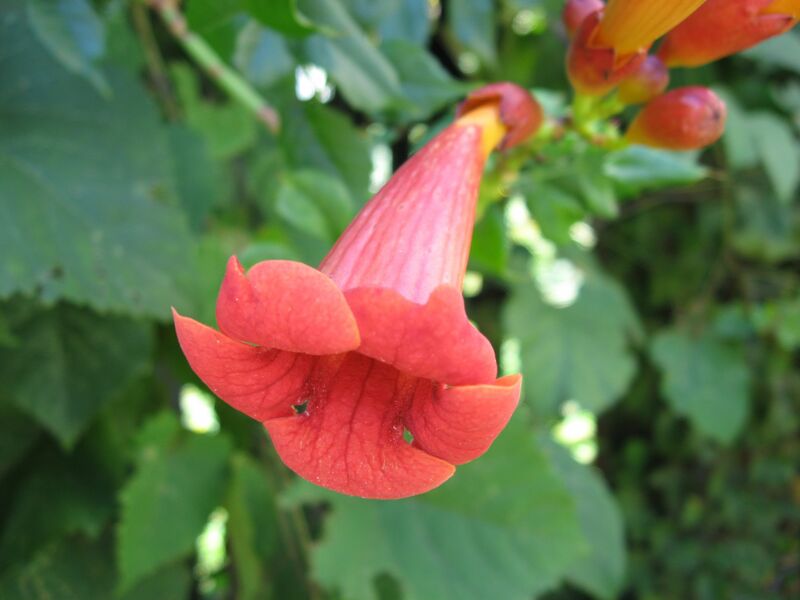 Hummingbirds also love the Impatiens capensis, the Jewelweed. 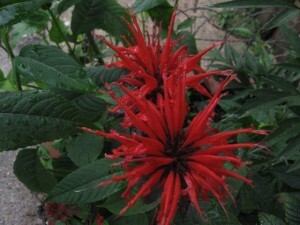 This flower is designed for the hummingbird, with its elongated form, like all of the flowers displayed in this post. This one specimen is our favorite because we grew it from seed in our yard, just by tossing a few seeds near our drainpipe last September. Now we have flowers and hummingbirds blooming and buzzing about. The native plant Hummingbird garden is very low maintenance. 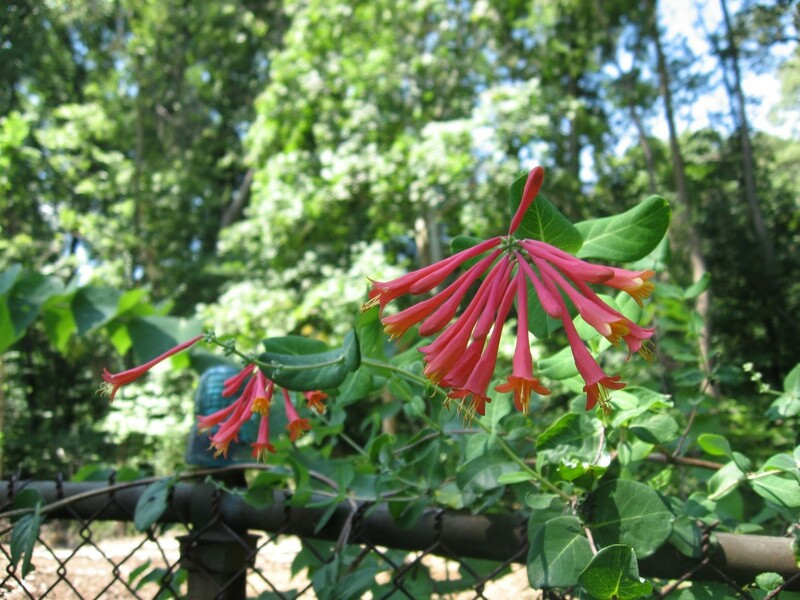 The honeysuckle can be purchased from your local native plant nursery. In Philly, we recommend Red bud nursery. Native plant sales in the Spring or Fall often offer these plants. The local nurseries will most likely sell you plants that are from a local source, which means that they are adapted to your area, and can survive the long haul, and will pay off your investment in the form of tidy dividends full of Hummingbirds and years of beautiful flowers. This will happen provided the plant is well placed in the garden, and that it is watered well after it is planted so it can establish itself. The nurseries will help you with selection and placement. The honeysuckles need to be given a bit of training to go up into the sun. Maybe some string, a trellis, something to help it get started. I like the desk photograph. It tells a good, solid story. Mark, Its a great spot to view our garden and nature and write for the Root. I miss my friends the hummingbirds! Thank you Sean for this wonderful post. Hopefully they will ride out the hurricane! 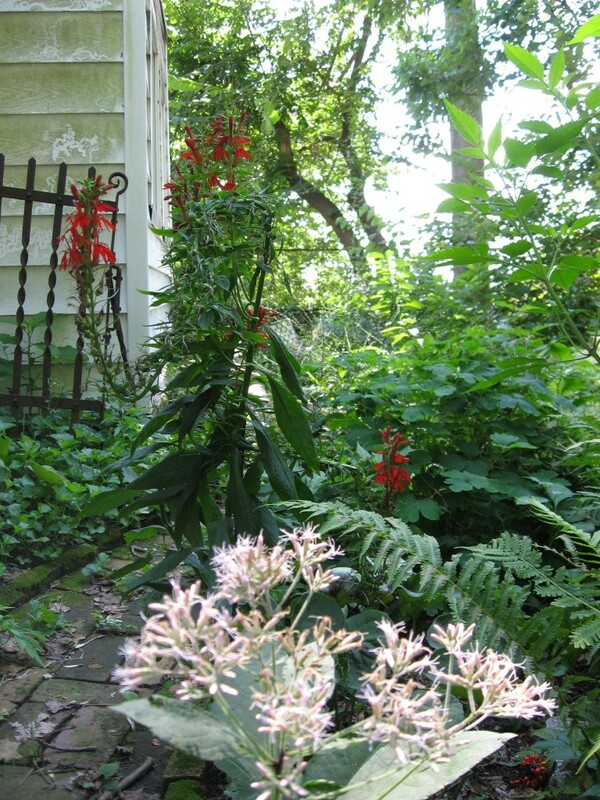 By the way, the Lobelia cardinalis in the back alley is blooming! Its still alive! 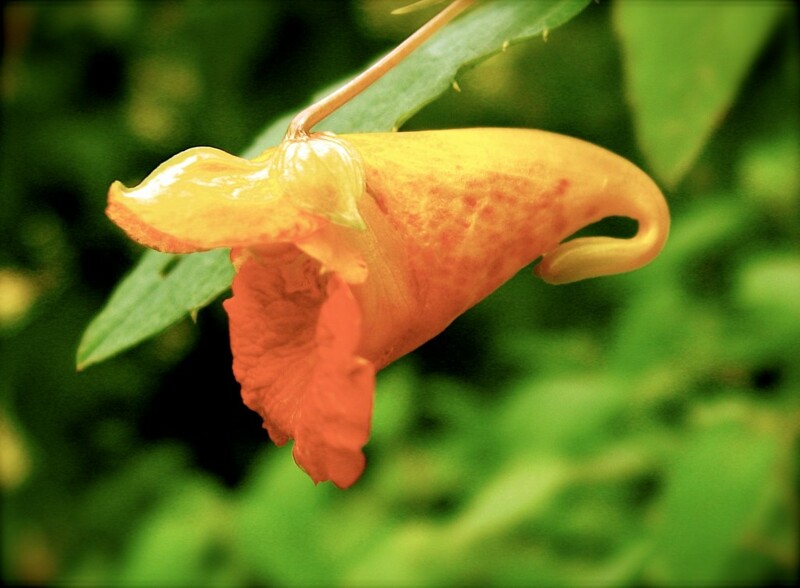 Also, there is a yellow jewelweed, i believe its called impatiens pallida, blooming in the backyard! 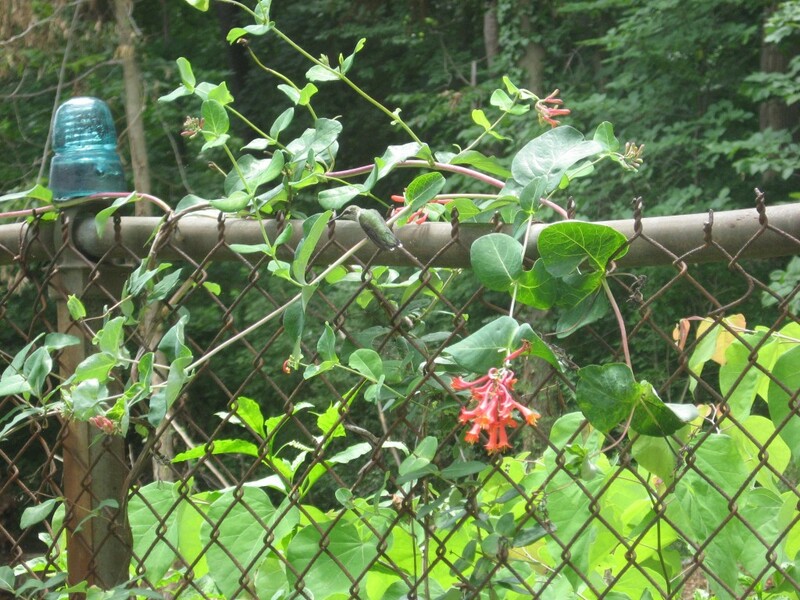 How will the delicate Jewelweed ride out a hurricane? Our jewelweed plants blew down but are still alive. I will stake them.